The Yassou Festival is usually celebrated every 3rd week of the month of June. This year, they have it with the Father's Day weekend. Although, the Celebration only last for two days, it is pretty nice to observed that, there were so many people who came and celebrate the said Festival. 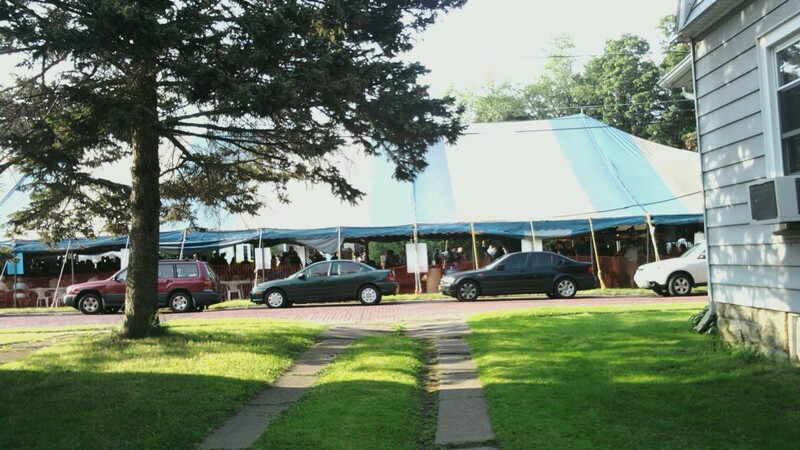 Hubby and his co-worker put up that tent a week before the celebration begins. There were different kind of items for sale, from clothing, bangles, common stuff, I am not sure if they have rubber stamp for sale too. The most good part is they have Greek food for sale. Although, it's way too expensive for a little piece, trying new food isn't bad. So, I bought some of the food that we never tried to buy before and hopefully they will be good. They also have Greek dancing every 2 hours and played Greek music that everyone is invited to dance on their dance floor. One disadvantages for us is, the music is just way too loud because they were located just in front of our house. Overall, is it one fun Festival Celebration again. And just for your information, it is affiliated with Orthodox Church.